I had a meeting with my Canon team today, and I took my 5D along. Whilst in the meeting somebody was talking about how they documented their feet on different types of concrete. This gave me an idea to document my journey home, as some of my earliest work at A levels documented journeys that I took. And these are the results of my journey home! A fun little project I set about on. I have been published within Notion magazine again! This time it was for a commissioned shoot rather than images from LCM or LFW. 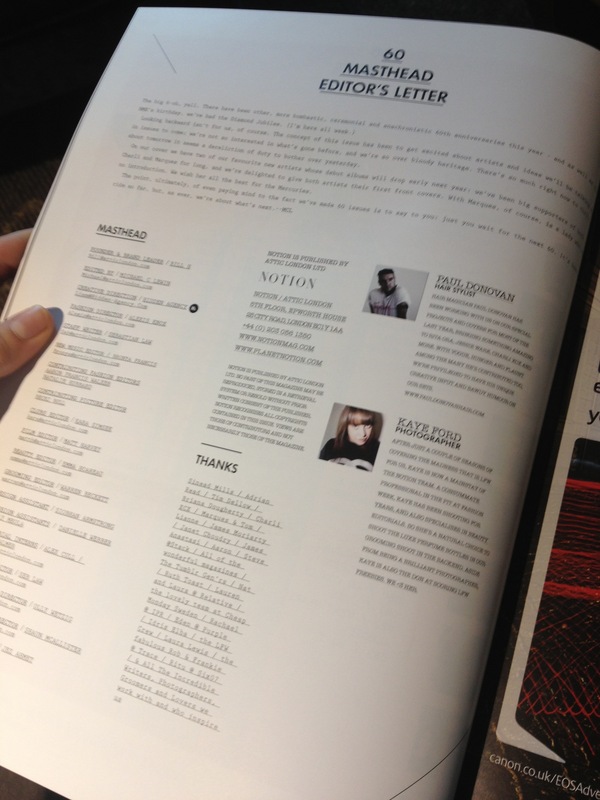 And as you can see, I also received a contributor’s section with a little bit about myself! I will get a proper scan of my contributor’s section, as well as my luxe grooming editorial for them, on my blog soon! I bought a Wolf hood the other day. A mock of a Spirithood. I think it would be a great prop for a photoshoot! Especially with some dark and heavy make-up. Am undecided whether I want to make it a beauty shoot, or do a self portrait shoot in the woodlands with it. I can always do both?